It has been sixty years since ‘Godzilla‘, the true king of all monsters first graced us with his appearance on the big screen. He definitely made a big impact on audiences around the world and spawned 31 sequels and remakes since then. Director Gareth Edwards brings that number to 32 with his epic and dark toned reboot that is sure to please fans young and old and have them roaring with joy as they exit the theater. Edwards was Hollywood’s top choice to reboot this franchise after everyone saw his 2010 film called ‘Monsters‘, which focused on two lost lonely souls who have to trek through a quarantined zone in Mexico, while evading giant tentacled monsters. That movie was so well done on every level and well received by critics, that Edwards seemed like the perfect choice to take on the king of all monsters. Over the years, we have seen Godzilla fight a variety of other giant monsters and sort of became the hero to root for as he fought evil giants from destroying the world, although Godzilla himself would wreak havoc on buildings and cities due to his size. Most of us know Godzilla as kind of a corny film series with a man in a giant lizard suit jumping around, but back in 1954, Godzilla’s first film, he was neither friend nor foe, and was not comical in anyway, despite just how ridiculous and funny the many sequels have been since then. We cut fifteen years later where Joe and Sandy’s kid, Ford (Aaron Taylor-Johnson) has a family of his own and is called to retrieve his father from Japan who has become reclusive and some sort of nutcase whose apartment walls are riddled with articles, images, and memos of what he’s been working on for the past twenty or more years and still trying to prove what caused the Janjira plant to fall to ashes fifteen years ago. Once Ford and Joe are reunited, Joe’s theories become true as we see a M.U.T.O., short for a Massive Unidentified Terrestrial Organism escape from an underground bunker and fly off in the sky, but not before causing tons of destruction. This M.U.T.O. has long insect like legs, red evil eyes, and one bad attitude. Unfortunately, this giant creature looks part robot and part insect and has no character definition whatsoever other than roaring sometimes. This is when more seismic activity comes up on everybody’s computer as Godzilla has awakened and has headed towards this M.U.T.O. This M.U.T.O. has two things on its mind. It needs to feed and lay eggs. It’s source of food is nuclear and senses out every nuclear warhead, missile and base that it can to eat. It also finds the male version to itself so it can breed along the way, which leads into a giant 2-on-1 steel cage match between the two M.U.T.O.’s and Godzilla himself in San Francisco. Edwards is an expert with his camera and captures the carnage brilliantly as fighter jets crash into buildings and men in parachutes try to dodge the chaos on the ground, all while three giant monsters are battling it out. It’s quite spectacular. However, we don’t fully see Godzilla until maybe halfway through the film, which is unfortunate since this is ‘Godzilla‘. But when he’s on camera, does he own every aspect of that screen. He’s a little big bigger and a little bit beefier than before, and is a beautiful creature not to be messed with. Even Godzilla’s eyes speak in volume to what he is feeling. I only hope that if future films are to come of this franchise, they show more of Godzilla in action. 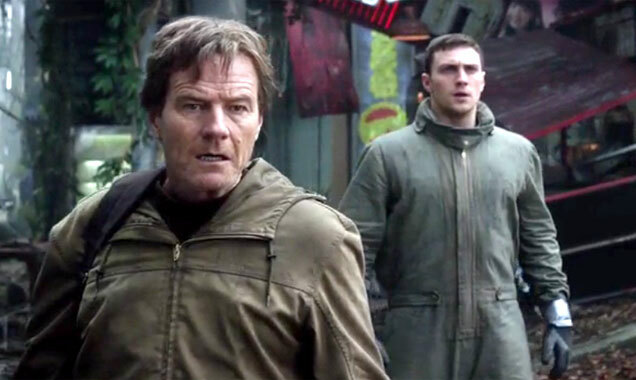 In addition to the very serious tone with this is the inability to connect with any of the characters besides Cranston’s Joe who turns in a great performance. I can’t say the same for anyone else though. Johnson could have been played by any hot male action star and had no direction or depth at all as he tried to diffuse bombs for the navy and help people along the way during the monster attacks. And Watanabe can only be seen in long distant glares at the chaos that was unfolding and uttering lines like “Let them fight”, which was an homage to the sillier sequels from the past. And Ford’s wife who is played by Elizabeth Olsen is good, but is not given much to work with and plays a frantic mother and wife for short spurts. But luckily, Edwards keeps the pace moving despite these things with great and beautiful action sequences in Hawaii and Las Vegas, before the ultimate San Francisco showdown. I just wish it took some of the characters a little while longer to accomplish certain tasks or be in a certain place rather than it happening on the first try every time. It took the realness out of the whole equation as odd as that may seem with this movie. All that being said, I thoroughly enjoyed this ‘Godzilla‘ and has no resemblance to the 1998 reboot from director Roland Emmerich that starred Matthew Broderick. In fact, it’s okay to completely forget that film was ever made. Evan’s ‘Godzilla‘ is a visual masterpiece and one of the finest monster and action films of all time. Nobody can make this amount of destruction look so beautiful and magnificent like Edwards. And even though we don’t get tons of time with Godzilla, the time we do is insanely fun and epic, which composer Alexandre Desplat’s score adds a lot of suspense and fun to the entire film. We have to see how well this one does first at the box office, which I hope scores big for weeks to come, because ” is definitely back and BADASS! Now let’s talk sequels. Edwards has said that he and his crew wanted to focus on this movie alone and not think about any other thing – even a sequel until after this movie. Hence there is no set up for a sequel here with the exception of a throw-away line in the middle of the film where someone mentions that there are giant monsters that emerge from deep in the ocean, much like Guillermo Del Toro’s ‘Pacific Rim‘ showcased last year. Hell, even Guillermo expressed interest in having Godzilla show up in a ‘Pacific Rim‘ sequel. Edwards acknowledged that and said if he were to do a sequel, he might explore the option of a Monster Island scenario, similar to something seen in ‘Destroy All Monsters‘. But rest-assured, nothing is being developed as of right now. We have to see how well this one does first at the box office, which I hope scores big for weeks to come, because ‘Godzilla‘ is definitely back and BADASS! 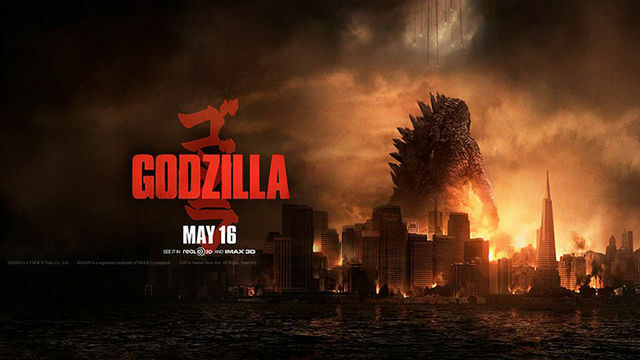 Here Is Ben’s Film Review of ‘Godzilla’ (2014)!! Feast Your Eyes on the New ‘Godzilla’ Poster!!! Film Review: ‘Transformers: Age of Extinction’!! This entry was posted on Tuesday, May 13th, 2014 at 5:21 pm	and is filed under Film, News. You can follow any responses to this entry through the RSS 2.0 feed. You can skip to the end and leave a response. Pinging is currently not allowed. « First Image of Ben Affleck as Batman! !